Photo by Mark E. Johnson. When it comes to working with students, we should approach copyright from two protective angles. One is to ensure that students don’t stray across copyright laws and willfully or accidentally infringe on a creator’s rights. The second is to ensure a full understanding of how to protect their own works. Photographers, designers and reporters will all have to deal with sourcing images at some point. It is essential they know both the legal and ethical implications of where those images are coming from. Sliding back in time to 1986, Mary Engel brought suit, as executrix of her late mother Ruth Orkin’s estate, against a T-shirt manufacturer claiming they had based a design on one of Orkin’s photographs. The manufacturer and distributor admitted their art director had based the design on a photo he had seen in a book. The court’s decision, coming back in favor of Engel, set statutory damages at $20,000, plus attorney’s fees. The manufacturer and distributor were ordered to pay $23,000 and turn over all of the remaining shirts. Was it worth the risk? The companies reported the total profit from sales of the shirt was just more than $1,000. An anomaly in the courts? Skip forward to 2013 when the courts found in favor of Daniel Morel in his case against Agence France-Presse and Getty. Morel was in Haiti when the 2010 earthquake struck and quickly sent out images via his Twitter account. They were retweeted, without attribution, and then picked up by the wire service for distribution, placing his images around the world within a matter of hours — without Morel granting the rights to copy and distribute them. The case, which is under appeal, was decided last year in favor of Morel, with a jury finding that Agence France-Presse and Getty had willfully infringed his copyright and awarding statutory damages of $1.2 million — for using an image from Twitter without permission. As educators, what can we do with these cases? The first and most obvious is to use them as examples of why having permission to use images is critical — the costs of not doing so can be enormous. But it also drives home the need to talk about how to find images that students and professionals can use in their storytelling. The first stop is to contract with a photojournalist to provide custom work though that can be cost-prohibitive. The second stop should be at a reputable stock agency where you can license images that have already been created. Lastly, you can turn to works that are in the public domain. There are three core ways that images can end up in the public domain. The first involves waiting a very long time — copyright protections extend 70 years after the death of a creator for any work created after 1978. The second option is works created by federal or state governments as those works would be owned by the people and should be okay to use. However, government agencies do not always create their own images and will sometimes contract out that work to others. Depending on how those contracts are written, those works may not fall into the public domain and it is incumbent on the user to certify those works are usable. The last category is perhaps the most complex yet easiest to sort through. Over the last decade there has been a movement among creators to allow limited usage of their works using something called Creative Commons licensing. There are several levels that can be set, from anyone can use it for anything to very limited personal, non-commercial usage. Using Flickr’s Advanced Search will help you find available, royalty-free images. 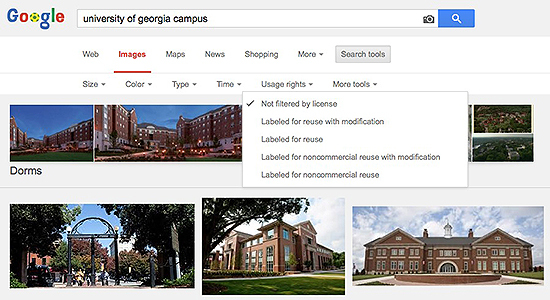 Google’s image search also has a filter for usage rights. The more commonly used Google image search has a similar function. By clicking on Search Tools and then Usage Rights, you will see a series of options to help narrow down the results. Both of these systems are relying upon the authors to tag their images appropriately — and to have the rights to do so. Are images chosen through these tools defensible in a copyright infringement claim? Well … there would be an argument to be made that it wasn’t willful infringement, but whether you prevail would be up to a jury. One of the most common defenses in copyright claims is that the usage falls under the “fair use” doctrine. Journalistic or educational usage does not automatically fall under the umbrella of fair use and this is one of the largest misunderstandings out there (though this was not part of the defense in the Morel case). 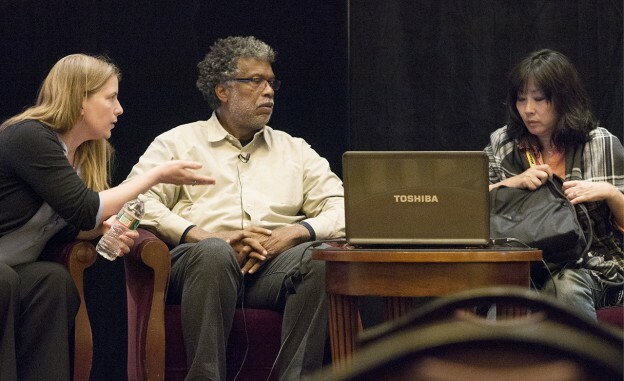 Building a robust segment on copyright and fair use into an early journalism course, before students start looking for source or supporting material, is critical to their education. The other side of this is the works students create themselves, all of which are protected by federal copyright laws. Copyright is created at the moment a work is fixed in a tangible form — essentially, when a photograph is written to memory or a document is saved, it has federal protections. There is nothing more that authors need to do unless they want to file suit for an infringement and, again, this is something that should be built into every journalism curriculum. The copyright office gives authors the ability to register their work. In order to file suit, you must register your work — this is how you prove you own an image, video or other type of work. There are two times most authors will register their work. The first is when they are notified of an infringement and want to file suit. This can be done at any time, but there is a significant penalty — if an infringement happens before registration, all that the author is eligible for is actual damages. The second possibility is to register the work within three months of its creation or before an infringement happens. The advantage here is that you can now file an infringement suit for statutory damages and those awards are significantly higher than the actual damages. John Harrington’s latest book has an entire chapter on copyright registration workflow. In the same way we talk about having a workflow for processing images, videos or even notes, you need to have a workflow for copyright registration. 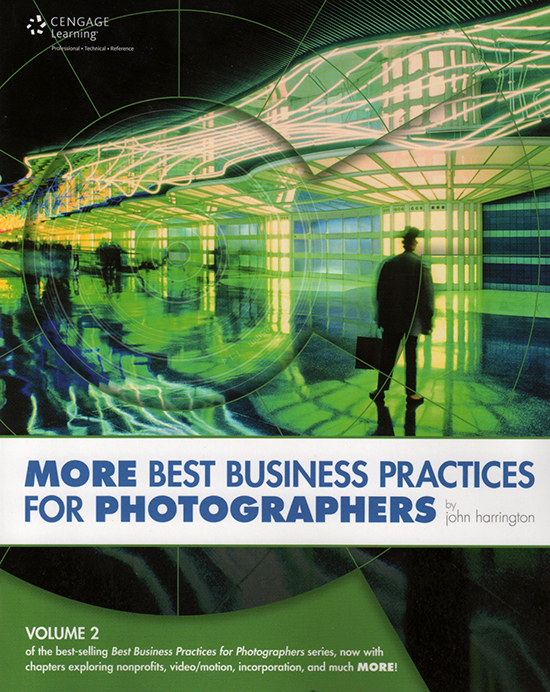 In his latest (and highly recommended) book, More Best Business Practices for Photographers, John Harrington has a 40-page, step-by-step guide on how to do bulk registrations of photographs. It should be required reading for every content creator out there. When and how are copyright protections enacted? How do you register a work? What are the consequences of infringing a work? What is fair use and what is not fair use? How do you license works? How do you find public domain or released works? These principles should be taught to any student who will be dealing with publishing. Photographers, designers and reporters will all have to deal with sourcing images at some point, so it is essential they know both the legal and ethical implications of where those images are coming from. Mark E. Johnson is the senior lecturer of photojournalism at the University of Georgia’s Grady College of Journalism and Mass Communication, still shoots a photo every day and comments on visual journalism at VisualJournalism.info. Follow him @markejohnson.